The South by Southwest (SXSW) Interactive, Film and Music Festival, hosted each year in Austin, Texas, is one of the biggest and most sought-after live marketing opportunities all year, thanks largely to the 50,000 attendees who are members of a hip, trend-seeking and mostly well-funded demographic. EM hit the streets, exhibit halls, barrooms (and, um, dance floors) during the fest’s Interactive days to bring you the lowdown on the activations that rocked out, and the attempts that played a little flat. For a visual peek into some of the activations, don’t miss the photo gallery over on the right. 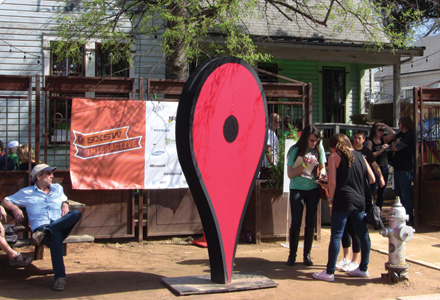 Many of the brands, especially the big sponsors looking to make a splash, took to the streets to create experiences and parties designed to turn heads and earn the love of the SXSW trendsetters. Most of them went for a straight up party, with some signage and a local or music festival band to rock the house ’til the wee hours of the morning. Bravo, CNET, Doritos, Ford, IFC and Yahoo! were among the best ones we could get into (the Mashable House and Thrillist RockTails bar were too hot even for us). Many of the brands took over local bars, lots of which were on historic 6th Street, lending the sponsor a flavor of cool right off the bat. While the activations were similar, simple and exactly what the people wanted, there were some touches that made each party sing its own tune. Bravo, handled by Grand Central Marketing, New York City, broke the mold and threw its party outside, under some tents (rain be damned, eh, Bravo? ), and the Budweiser and custom cocktails kept the partygoers warm and cozy. Doritos went huge with a three-story vending machine looming over its party. Ford partnered with music blog Kickkicksnare to showcase some of the hottest new music in town. And IFC worked with partner Time Warner to throw a party to promote a project it’s doing with will.i.am that’s designed to help kids 10 to 15 years old become innovators and idea creators. Yahoo! was promoting a film partnership with Tom Hanks (handled by e2 Marketing, New York City) and CNET threw an ’80s party thanks to local new wave cover band, the Spazmatics. Rad, dude. Google took over four trendy bars and an entire city street to establish its off-site Google Village footprint as one of the coolest hangouts not at an official venue (nice). Each bar was decked out in a theme and dedicated to one of Google’s products, suites of products or user bases. The “Maps” house focused on location technology, both current and new software and APIs. Just outside was the Street View Car, which quickly became a backdrop for fans’ photos. The “Android” house was all about the brand’s operating system, both for mobile and traditional devices. It was fun, and covered with custom-made versions of the Android robot. The “Developer” house hosted a LEGO build-a-thon on Sunday morning and hacker talks throughout its run; and the “Discovery” house was all about Google’s plans for the future, complete with upcoming product demos and opportunities to get on early beta testing lists for them. With such a variety of activities, we found ourselves spending a lot of time there and loving it. 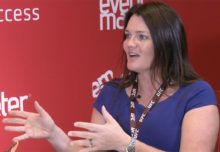 The recent addition of former American Express event marketing guru Jessica Igoe is starting to show (Agency: Sparks, Philadelphia). Samsung created a truly multi-purpose space which it leveraged for both day and night events designed to draw maximum buzz and excitement. During the day, the space operated as an art gallery, with exhibits showcasing the brand’s new device, the Samsung Galaxy Note, and its features. 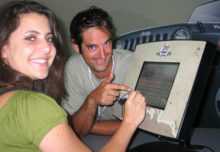 Before heading into the gallery proper, however, brand ambassadors took some time with visitors to demo the device. Inside, a Microsoft Kinect and Note-powered exhibit allowed attendees to gesture through some of the social media content posted about Samsung throughout SXSW with the hashtag #FEEDHunted. Another exhibit featured a facial recognition and motion capture system linked to a Note that was set up to create unique music and collage-style visual art via response to the attendee’s facial expressions and head movements. Wicked. There were some less location-based activations, too, and we thought they were great. First of all, the food trucks were everywhere, mostly thanks to local vendors, and always delicious. We had to take time to get behind the wheel of the 450 horsepower 2012 Chevrolet Corvette thanks to the Drive a Chevy ride and drive experience, which gave consumers a chance to drive one of six models, including the ’vette, Volt and Camaro. The cool factor was that you took it out on the real roads, in traffic, and not on a closed course. It was fun, but the heavy traffic made each ride really long, so the wait was pretty long, too. Chevy also brought back its “Catch a Chevy” program for the second year, which gives SXSW peeps free rides all over Austin (they could tweet for a pickup within a six-mile radius). A serious perk with 45 cars looking for “fares” and riders given a taste of a smooth ride and the OnStar experience. We also took a chance on a free bike rental thanks to HBO and a local bicycle shop. We kept it for just one day, however, since if we kept the folding bike overnight, we’d have had to come up with the $100 overnight rental fee. FedEx, which was not an official sponsor, was also on the scene with brand ambassadors in FedEx livery walking around the whole downtown area “delivering” power for mobile devices as very popular mobile charging stations. One agency raised some national controversy with another mobile activation known as “Homeless Hot Spots.” The agency “hired” homeless people for $20, gave them a wifi hotspot in a backpack and made them wear a dehumanizing shirt that read “I am a hotspot.” Not I HAVE a hotspot. Eesh. Needless to say, it was a fail for all concerned. Most of the sponsor action was away from the convention center, since most of the real estate was reserved for content sessions (imagine that!). The notable exceptions were at the Palmer Center, home of the gaming-focused Screenburn Zone consumer trade show floor, and the main Interactive trade show in the Austin Convention Center’s double hall. The huge hall hosted about 300 exhibitors, most of whom were brand new tech startups, so they had no money yet, and so they did the whole table and curtain backdrop thing. Regardless, a few big names stood out. Symantec went all out with a full-on double-expandable trailer inside the hall. Attendees went inside the Norton Operation Shield exhibit armed with a barcode swipe card. The idea was to defend your devices from malicious attacks with the help of Symantec products via a series of clever gaming stations. At the end, players took a test on the brand and product points they learned by playing the games, and the highest scorers won prizes. It wrapped up with a green-screen photo activation so the folks had something to remember the brand by. Agency: IMGLive, Norcross, GA.
One of the best-looking booths was by Otterbox, the mobile device and laptop case maker famous for being rugged enough to protect devices from any kind of torture. They had the tallest booth, a huge yellow cylinder that could be seen from all over the hall, and they also had one of the most fun games. A staffer threw a cell phone wearing an Otterbox case down a “Plinko” board, and the players guessed where it would land in order to win a prize. Some trusting fans of the brand put their own Otterbox-protected devices through the course, and they got some of the best prizes. Dell had an understated exhibit, basically set up to show off its Ultrabook laptops. Staffers were on hand to do demos, or consumers were free to play on their own. To keep them interested and grab some leads, the brand was raffling off an Alienware laptop, loaded to the gills. There were dozens of photo and video activations, but one of the best was thanks to the New York Film Academy. The school, which was looking to get the word out among up-and-coming filmmakers, and maybe even get some enrollment, had its pro cameras set up to film the guests sitting on a retro motorcycle and sidecar in front of a green-screen cityscape. They were given a link to a microsite to download the videos later. Fun. Cricket Wireless went small and simple, and did well as a result. Yes, the devices were on display, but what the people came for was the awesome spin art, done up to the attendee’s custom specs and spun out on an old 45-rpm record (Agency: BeCore, Los Angeles). Elsewhere in Austin, at the beautiful Palmer Center, the gamers got in on the action with the Screenburn Zone, where brands like Alienware, Intel and IGN took the opportunity to show the people what they’ve got. Alienware, top sponsor of the zone, went with a gaming arena, running back-to-back contests among attendees, who lined up for the privilege of stepping up to the screen and going head-to-head. Borglar was a new Augmented Reality startup, which specializes in layering AR games and special offers over real locations and making the whole experience interactive for the users and lucrative for the businesses. To show off the software’s chops, the startup was running a game throughout SXSW and winners got exclusive (secret) prizes. Intel was on hand, but not in huge fashion. The processor brand was showing off its new hardware, loaded into some Ultrabooks, and letting consumers go hands-on to see the speed for themselves. There was a lot more, and though we don’t have room for it here, look to the EM website for photos, video and some startups to keep an eye on.